Performer, colori, maschere, follia, gadget, coriandoli e un'atmosfera che mette allegria a tutti quanti. Ecco cos'è elrow, party spagnolo nato a Barcellona oltre 10 anni fa, ormai di riferimento in tutto il mondo, Ibiza compresa, in top club come l'Amnesia e l'Ushuaia. Lo slogan che presenta la festa dice molto: insieme facciamo succedere cose magiche, in inglese togheter we make magic happen. Martedì 7 agosto 2018 questa festa straordinaria fa ballare Gallipoli, in un evento organizzato da Musicaeparole, colosso del clubbing del Sud Italia. Più precisamente, la crew di elrow porta in Salento lo show "Chinese Row Year", un evento ispirato alla cultura ed alle feste orientali, alla loro magica follia. L'evento ha un orario particolare ed una location decisamente interessante: riempie di musica e divertimento un party serale, dalle 18 alle 2 di notte, l'Hotel Gallipoli Resort. 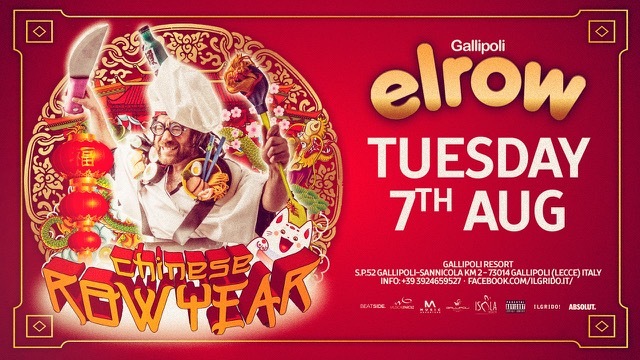 ENGLISH /// 7/8 elrow Chinese Row Year @ Gallipoli Resort, event by Musicaeparole /// Facebook event: goo.gl/mgwxh9. My inspired idea - travel with Chen to his birthplace in Huan Province, where they really know how to celebrate the Chinese 'RowYear'. I needed an awesome party! After a serious dim-sum munchie session, his family gave me a red envelope containing money (it seems to be a tradition here).Then, under the light of the new moon, completely unrecognisable in my canine fancy dress (What else? It's is the year of the dog after all!) a party beyond my wildest dreams! They introduced me to Nian, an absolute beast who seemed to be looking for trouble, although I got the feeling that he just wanted to have a good time and dance. So, I danced the Dragon Dance with him to scare away the bad spirits and, well, I don't know if it was the chinese lanterns, the red (which was everywhere), or maybe it was all those Baijius I was given, but I got a huge vibe of happiness and energy out of the whole party. The end? What happened at the end was an ABSOLUTELY AWESOME explosive chaos! Chen's mother said to me, "Welcome to China. In our culture the more people there are and the more racket there is, the more prosperous we'll be." So, I took her at her word and decided to throw my own party in elrow, with thousands of dancing party people making a mind-blowing amount of noise!